Wolfmother surprised fans last night by pulling a Beyonce and stealthily releasing their third record, New Crown, online. It’s the first new material from the band since 2009′s Cosmic Egg and it follows a strange 2013 for the Australian hard rockers. In 2013, Wolfmother logged what’s surely the shortest break-up ever, with the Aussie rockers getting back together for a show in Los Angeles a whopping 10 weeks after they played their “final show” supporting Aerosmith in Melbourne. Last year, frontman Andrew Stockdale called it quits to embark on a solo career, releasing his debut album Keep Moving under his own name. Explaining that he was never going to say never to reviving the Wolfmother name, barely a month after the solo album dropped, the band promptly got back to work on a new release, the product of which has become New Crown. New Crown sees the three-pice travel back to their seventies-tinged psychedelic rock roots. Consisting of current lineup Stockdale, bassist/keyboardist Ian Peres, and drummer Vin Steele, Wolfmother’s New Crown is available to stream on bandcamp right now. Check out a preview below. 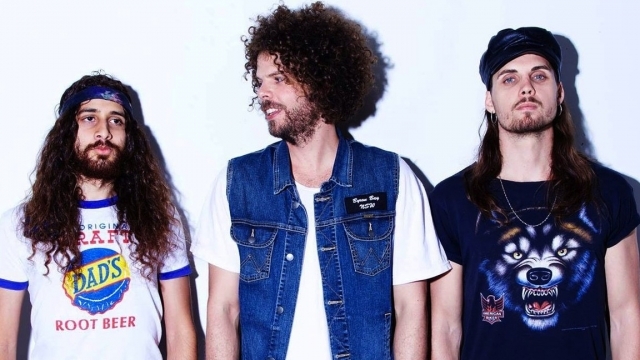 Wolfmother have also announced they will be playing just two shows, one each in Sydney and Melbourne before venturing off to tour the States. Details below.